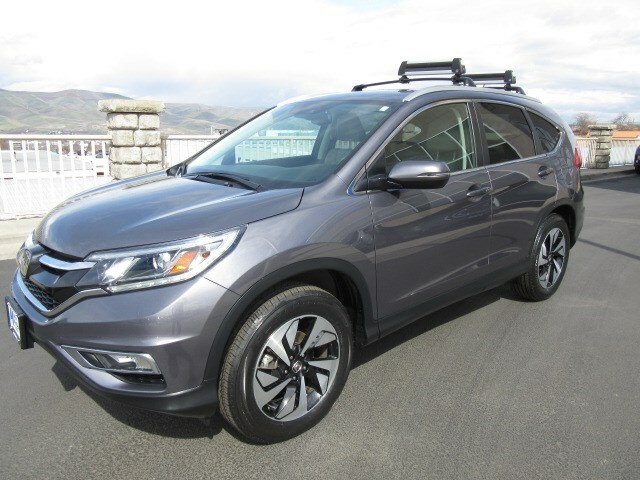 Our 2016 Honda CR-V Touring AWD is handsome in Modern Steel Metallic! Powered by an award-winning 2.4 Liter 4 Cylinder that offers 185hp while paired to a CVT with sport mode that rewards you with easy passing and light towing demands. This All Wheel Drive is ready to take on whatever your lifestyle requires even when roads are less than ideal and offers near 32mpg on the highway. CR-V is the ideal balance of size and capability plus the elegant contours of our CR-V Touring are enhanced by projector beam halogen headlights, a power tailgate, and a sunroof. Built with your busy lifestyle in mind, the interior of our Touring greets you with an automatic-dimming rearview mirror, dual-zone automatic climate control, push-button start, and heated leather-trimmed seats. You'll appreciate the ease of use of the high-resolution touchscreen, full-color navigation, HondaLink, SMS Text message function, Bluetooth, premium audio with satellite radio, and Pandora compatibility; while an illuminated steering wheel with cruise, audio, phone and i-MID controls keeps power at your fingertips. Of course, with massive cargo space, a retractable cargo area cover, and 60/40 split rear seats, the CR-V can handle your family and everything they need for their many adventures! Built to a standard befitting its stellar reputation, our Honda is well-equipped with a multi-angle rearview camera, collision mitigation, forward collision warning, adaptive cruise control, advanced airbags, and other innovative safety features. This is a smart choice that you'll be happy you made! Print this page and call us Now... We Know You Will Enjoy Your Test Drive Towards Ownership!